The study of fluids, which can be either liquids or gases, introduces students to fluid mechanics, an area of knowledge important in many industries (such as aeronautics, engineering, meteorology, and oceanography). Fluids, including air and water, are essential to many industrial processes and form the basis of hydraulic and pneumatic devices. Students will learn about the properties of fluids by experimenting with and investigating the viscosity and density of different liquids and ways in which these properties affect objects placed in those liquids. 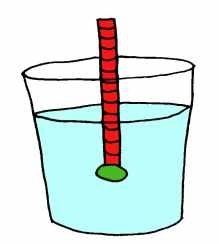 Students will explore the implications of Archimedes’ Principle by investigating and measuring the buoyant forces on different objects. As well, they will learn about the diverse applications of the principles involved in fluid mechanics, including industrial applications such as jet propulsion, and everyday applications such as ensuring that sauces are cooked to the right consistency (degree of viscosity). 9 LEVEL DENSITY TOWER - Which Fluid has the highest density? A Fluid is a state of matter, such as liquid or gas, in which the component particles (generally molecules) can move past one another. Fluids flow easily and conform to the shape of their containers. Solids are not considered to be fluids because their molecules cannot move past one another and thus they have a definite shape. 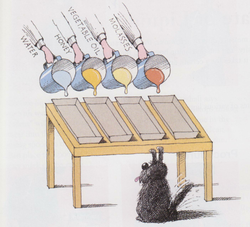 Viscosity refers to the resistance of a substance to flow. For example, water has a lower viscosity than molasses and flows more easily. 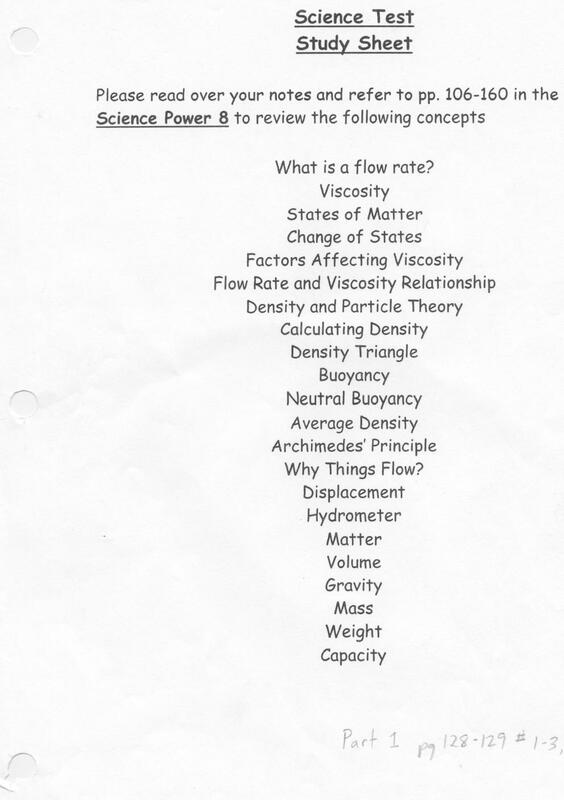 Flow Rate is the the amount of fluid that flows in a given time across a given distance. Flow rate provides a measurement to determine how viscous (thick or thin) a fluid is. The viscosity (and thus flow rate) of a fluid can be altered by temperature. To start today's class we did this neat "Density Tower" demonstration to get the students interested in the topic of fluids. Check it out. Students were assigned a title page to complete based on the theme of the unit. For ideas about what images to include on the title page refer to pages 109 - 199 of the Science Is textbook. 1. The title of the unit must be displayed prominently on the page in block or bubble lettering. 2. 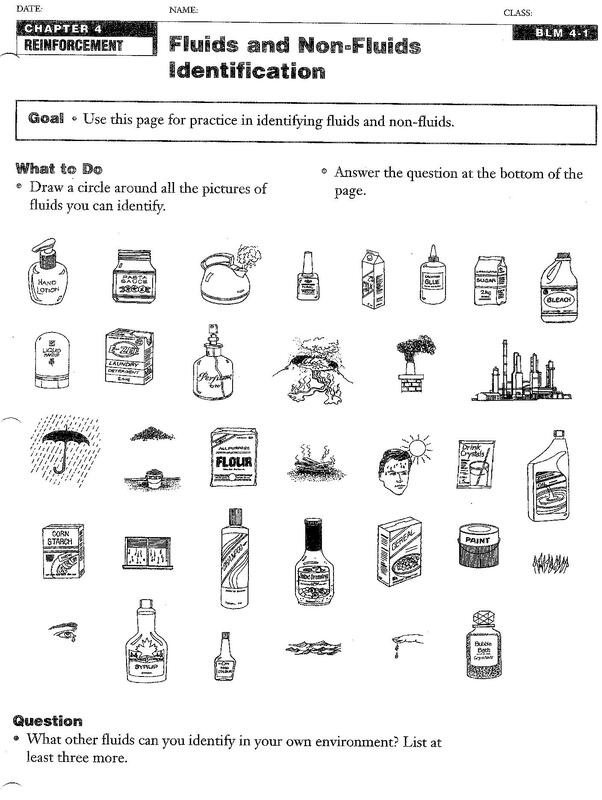 The page must include 3 or more diagrams that are related to the theme of the unit. 3. The entire page must be coloured in, and the images and lettering should be outlined with a colour that makes them stand out from the background. 4. A short written component must appear on the back on the title page that highlights how each of the images that were selected relate to the theme. 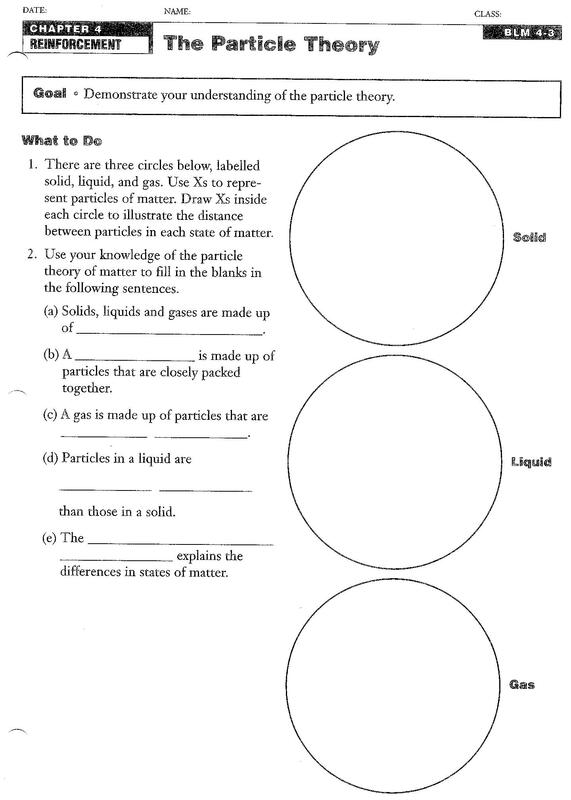 Building on last day's lesson, the students are asked to complete the following two activity pages and then insert them into their science duotangs. Change of State - The transformation of a substances physical state into another state. Melting - The process of changing from a solid to a liquid. Vaporization - The process of changing from a liquid to gas. Condensation - The process of changing from a gas to a liquid. Freezing - The process of changing from a liquid to a solid. Sublimation - The process of changing from a solid to a gas without going through the liquid state. ** Today the students were introduced to a fourth state of matter called "suspension". In small groups, the students created "Magic Mud" and got the opportunity to "play" with it and watch it's magical properties. HOW FAST DO FLUIDS FLOW? Some fluids flow faster than others. While orange juice flows freely, honey or syrup pours at a slower rate. In order to compare the speed at which fluids flow we will measure the flow rate of various liquids in our first science lab. Flow Rate - The time it takes for a fluid to flow from one point to another. It is a good indicator of viscosity. To calculate flow rate you need to measure the time (in seconds) that it takes for a certain amount of a fluid to travel a specific distance (in centimeters). Today students participated in a science experiment called "Measuring the Flow Rate of Liquids." To see the procedure for the investigation refer to pages 118-119 of the Science Is textbook. The following clip shows a close proximity to the lab that we will conduct in class comparing the various liquids, their viscosities and their flow rates. (1) Temperature has an affect on flow rate. In most cases, the hotter the temperature the higher the flow rate, while the colder the temperature the slower the flow rate. (2) Fluids have different viscosities and size of the particles (bulkiness). (3) Internal friction (rubbing) of particles as they slip past each other also varies between liquids. Today students will watch a short video on "The Boston Molasses Disaster of 1919." This documentary (created by the History Channel - Biggest Disasters of the 20th Century) not only describes the tragic impact that temperature can have on fluids, but more importantly demonstrates the need for humans to not cut corner when constructing tanks that hold large quantities of certain fluids. The first clip demonstrates the impact that temperature can have on the viscosity of a fluid. ​The final two clips provide a description of the events leading up to, during and then after this disastrous flood. Density is basically how much "stuff" is smashed into a particular area... or a comparison between an object's mass and volume. Based on this equation, if the weight (or mass) of something increases but the volume stays the same, the density has to go up. 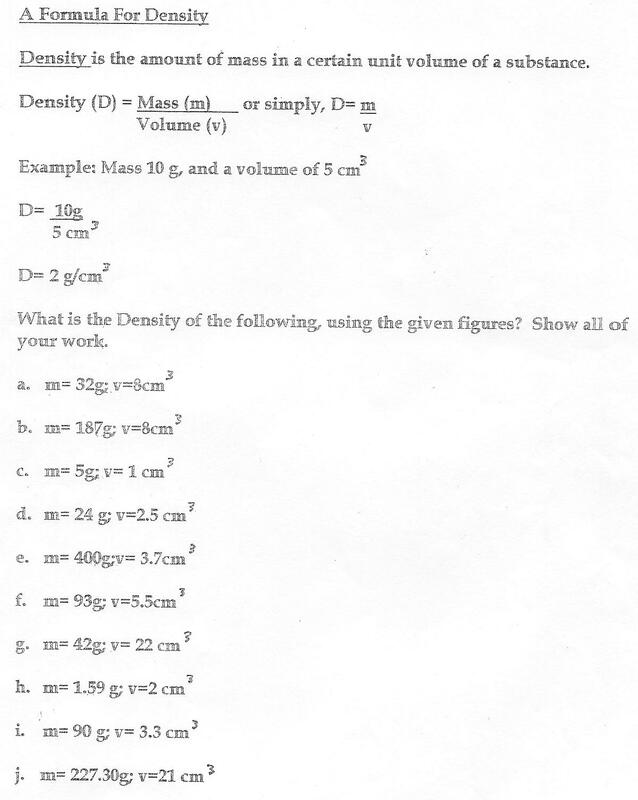 Likewise, if the mass decreases but the volume stays the same, the density has to go down. Think back to the density tower we made at the beginning of this science unit. Lighter liquids (like water or rubbing alcohol) are less dense than heavy liquids (like molasses or dish soap) and so float on top of the more dense layers. We can apply the lesson of "sinking and floating" when liquids are mixed to the disaster of the Gulf Oil Spill. 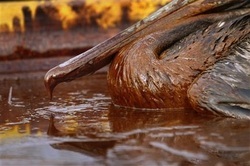 The 2010 Gulf of Mexico oil spill has been described as the worst environmental disaster in US history. On the 20th day of April, the Deepwater Horizon (see picture here http://bit.ly/pbm3W1) rig blew up killing eleven workers. The subsequent oil spill affected hundreds of miles of Gulf coastline, causing serious economic damage to the region, both in terms of tourism and fishing. As a followup to todays lesson the students were asked to complete a "Differing Densities Chart" activity page and a cross word puzzle on some of the key vocabulary words from our unit so far. 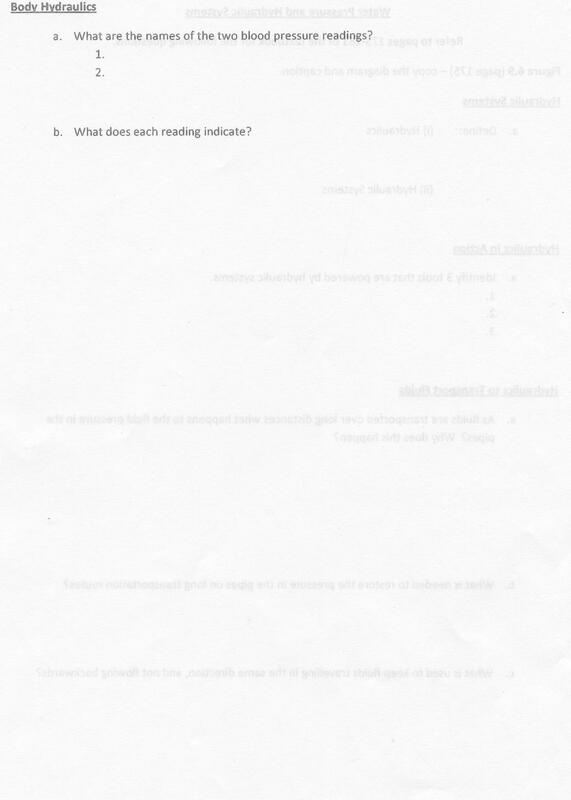 On top of this, the students were to complete the "Check Your Understanding" page 136 #1-3 from their textbooks. Today students worked with the density formula (density = mass/volume). They were introduced to the density triangle which is a trick that will tell them which formula to use in order to find the density, mass, or volume when you have been given the other two. To find the formula for "Density," cover up the "D". This leaves the "M" overtop of the "V," giving you the formula "M/V." Therefore, the fomula is D=M/V. To find the formula for "Volume," cover up the "V". This leaves the the "M" overtop of the "D," giving you the formula "M/D." Therefore, the formula is V=M/D. To find the formula for "Mass," cover up the "M". 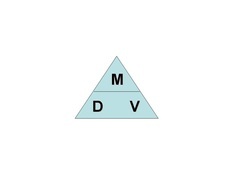 This leaves the the "D" beside the "V," giving you the formula "D x V." Therefore, the formula is M=D x V.
By using this trick, the students never have to remember any of the actual formulas. All they have to do is remember the "DMV" triangle. 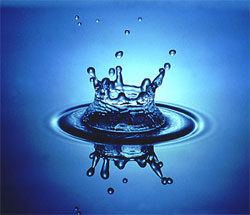 Buoyancy is the ability of an object to float in a liquid, such as water. This concept helps to explain why some things float while other objects sink. Buoyancy is an important factor in the design of many objects and in a number of water-based activities, such as boating or scuba diving. The mathematician Archimedes discovered much of how buoyancy works almost 2000 years ago. In his research, Archimedes discovered that an object is buoyed up by a force equal to the weight of the water displaced by the object. In other words, a inflatable boat that displaces 100 pounds (45 kilograms) of water is buoyed up by that same weight of support. An object that floats in the water is known as being positively buoyant. An object that sinks to the bottom is negatively buoyant, while an object that hovers at the same level in the water is neutrally-buoyant. This same idea helps to determine what will float in water and what will sink. If an object weighs more than the weight of the water it displaces, it will sink. If the object weighs less, it will float. This helps explain why a heavy ship can easily float in the water, while a much smaller and lighter brick will sink quickly. It isn't the size or shape of an object that primarily determines buoyancy, but the relation between an object's weight compared to the weight of the water the object displaces. Average Density - The total mass of all substances within an object divided by the total volume. By spreading out the mass of an object over a larger volume the average density is altered allowing objects to float that would otherwise sink. Archimedes’ principle is better known as the law of buoyancy. It states: Something submerged(partially or fully) in water experiences a force that tries to push it up (and out of the water). The amount of that force is exactly equal to the WEIGHT of the WATER that the object is displacing. Students were introduced to the following scientific measuring equipment: a Newton (spring) scale to measure weight, a triple beam balance to measure mass (grams), an overflow can to allow for water displacement and a graduated cylinder to measure volume (mL) to catch the displaced water from the overflow can. 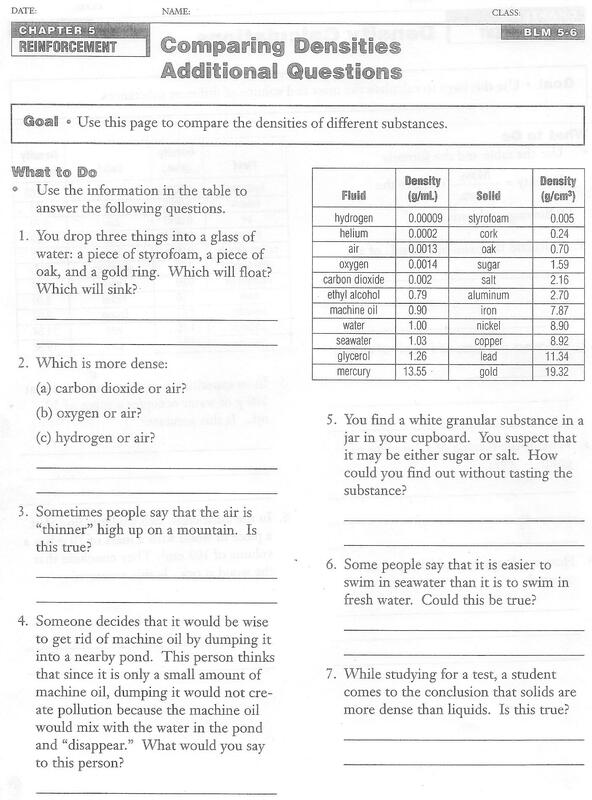 Students were asked to complete the "Check Your Understanding" page 158 #1, 3-7 from the Science Power 8 textbook. A hydrometer is a piece of equipment that measures the density of a liquid. A hydrometer will extend farther out of a liquid if the liquid has a higher density, and it will sink lower if the liquid has a lower density. For example, a hydrometer will float higher (or sink less) in water than in vegetable oil. Water has a density of 1 g/ml whereas vegetable oil has a density of 0.9 g/ml. 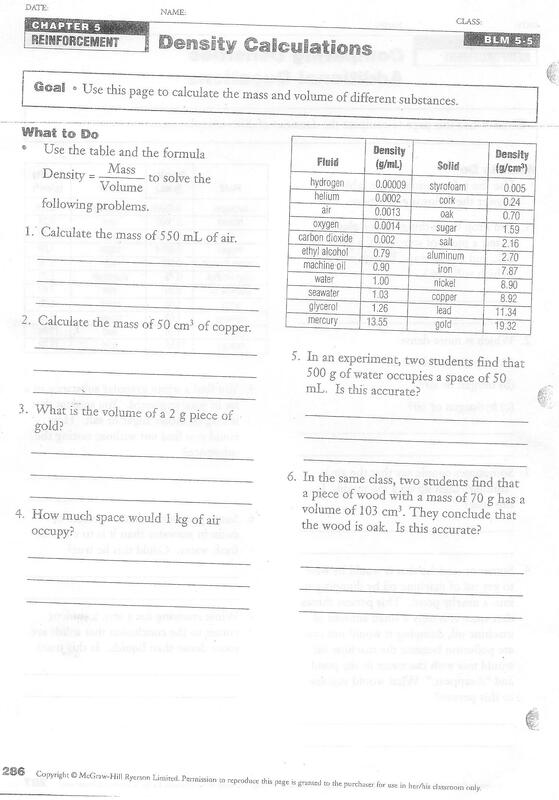 The following weblink provides a number of at-home experiments that can be done to explore the concepts of density. More important to todays lesson, there is a quick activity that shows how to create (and test) a hydrometer at home (check about half way through the video clip). Give it a try. We did this in class today. 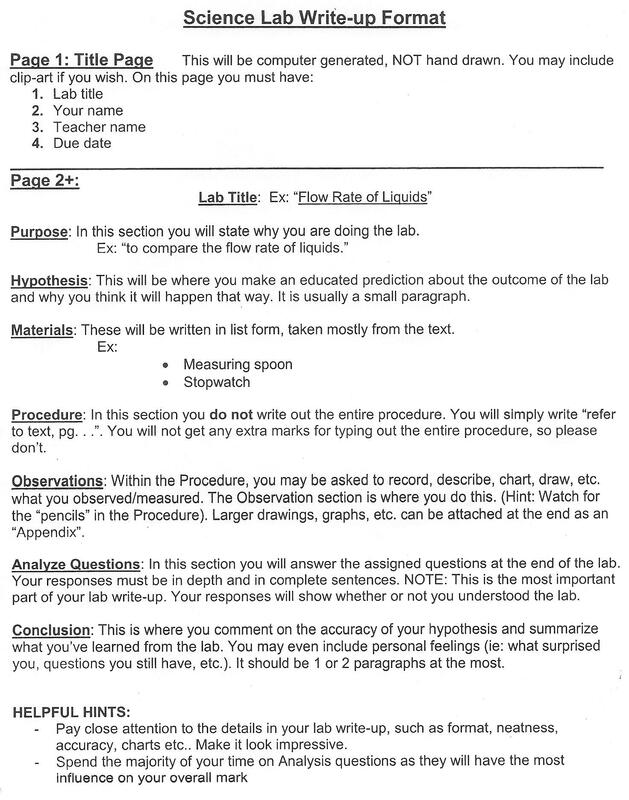 Today the students were asked to work on the review of the concepts we have investigated in regards to "Fluid Properties" over the first two months of school. The test for these concepts will be Friday, November 11th. Fluid pressure is used in many ways to make our lifes easier. The principle of 'compression' allows humans to develop machines that push fluids along a system. As the picture to the left shows, doing work by hand can be cumbursome, however machinery that does the same job provides more leisure time to do the things we enjoy. 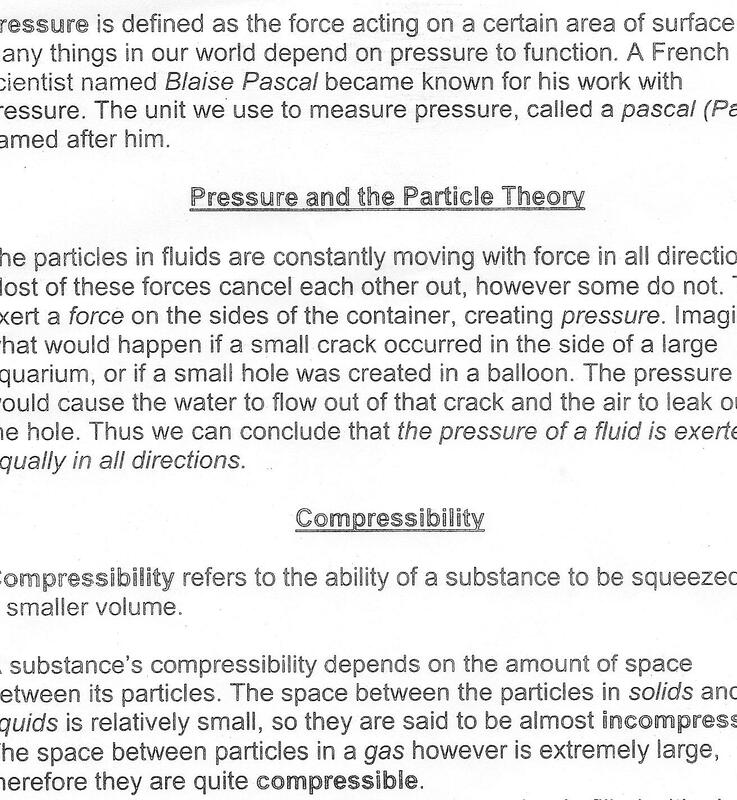 We discussed the French Scientist Blaise Pascal (1623-1662) and his contribution to the understanding of pressure. He inspired what is now known as Pascal's Law which states that when force is applied to an inclosed fluid, the increase in pressure is transmitted equally to all parts of the fluid. 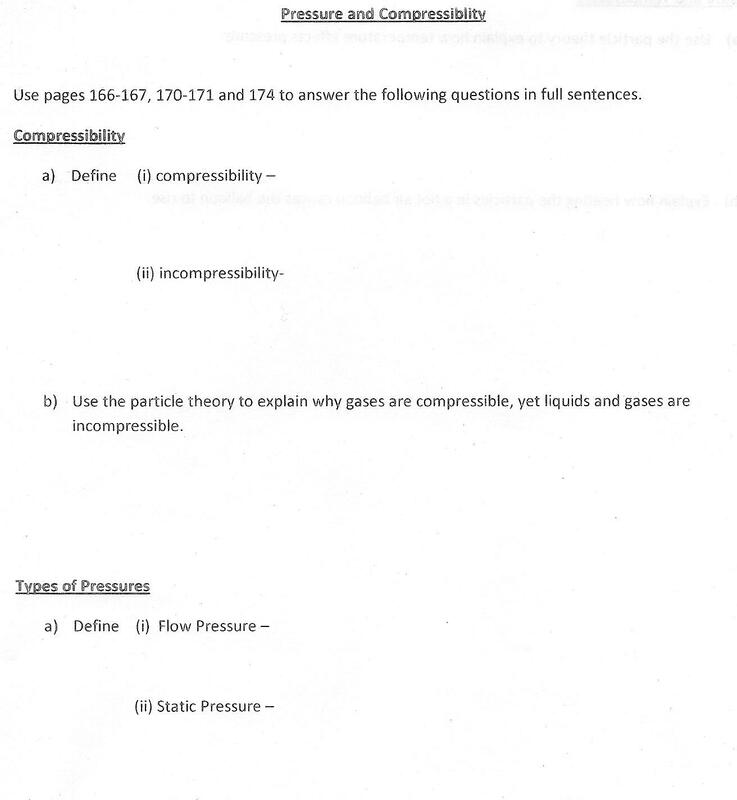 Today the students were asked to complete a worksheet entitled Pressure and Compressibility. Hydraulics is a branch of science and engineering concerned with the use of liquids to perform mechanical tasks. Typically, the fluid used in a hydraulic system is an incompressible liquid such as water or oil. Pressure is applied by a piston to fluid in a rigid vessel, causing the fluid to press on another piston that delivers energy to a load. If the areas of the two pistons are different, then the force applied to the first piston will be different from the force exerted by the second piston. This creates a mechanical advantage. A good way of demonstrating the basic principles of hydraulics is to join two syringes together with rubber tubing to make an watertight seal. The syringes can be filled with water, oil, or just air. Pushing plunger A causes plunger B to move out and pushing plunger B in causes plunger A to move out. This works even if the syringes are not in the same plane. i.e. if the tubing is bent by 90° as long as there is no kink in the tube that prevents the free flow of fluid. By adjusting the size of the syringes it is possible to demonstrate how to multiply force [see picture above]. A small mass on a small syringe can lift a much larger mass if it is resting on a bigger syringe. This is because the pressure in the two syringes is equal, but the surface areas of the two pistons are different, and force = pressure × area. The following video demonstrates how the use of syringes, fluid (water with food colouring) and tubing can result in a fairly complex lifting device that is (relatively) easy to create. 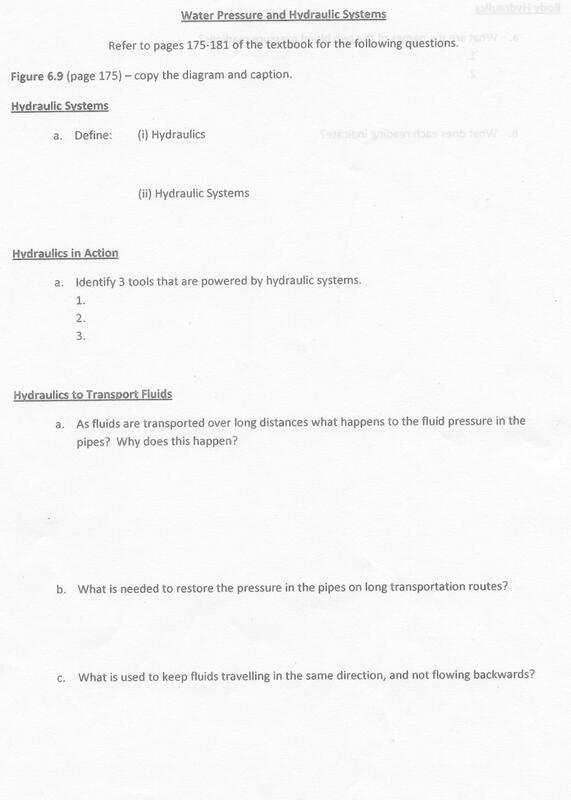 The students were assigned a worksheet entitled "Water Pressure and Hydraulic Systems" for homework. If they have misplaced the sheet they can download it from the files below. Air exerts pressure on everything that it surrounds. The study of pressure in gases is called "Pneumatics". We don't feel weighed down by air because the atmosphere is so well balanced by our bodies both inside and out. 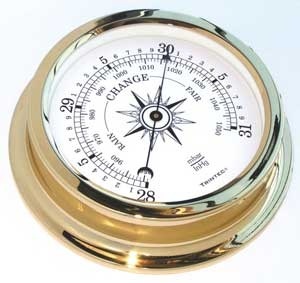 Air pressure changes with altitude. The higher we ascend a height the fewer air particles there are pressing against us on the outside of our bodies. The air pressure inside your body does not change as quickly though. This change in pressure causes our ear drums to "pop" as our bodies try to adjust. When the pressure inside of a closed container is lower than the pressure on the outside pushing in on the container, the walls of the container will buckle and cave in. 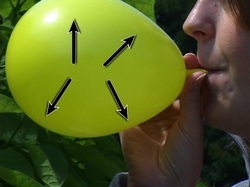 We observed this phenomena when we did a demonstration of an imploding pop can in class (see diagram and video below). Scientists use barometers to measure air pressure. 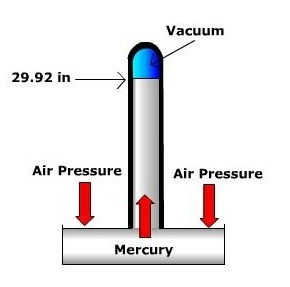 Most of these use mercury to help balance the air pressure. Many households use the more convenient aneroid barometer which contains no liquid at all. Humans use many machines that are powered by air pressure. Any time you hear a large transport trying to stop it makes a distinct sound. The brakes are powered bycompressed air pressure and are called "air brakes". The sound is also distinct when the brakes are decompressed (realeased) and the compressed air escapes. Many tools that utilize pneumatic systems are used in the construction industry because they are so efficient. Consumers can purchase pneumatic nail guns, staple guns, buffers, jackhammers and wrenches. The following video is a demonstration of what we did in class called "imploding pop can". It explains how to do the demonstration and the science behind why the can implodes. Take a view. The were asked to complete the activity sheet entitled Air Pressure and Pneumatic Systems. To complete our short unit on Pressure in Fluids, the students will complete a review of the key terms we investigated over the past two weeks. They will use this to prepare for a quiz later this week. 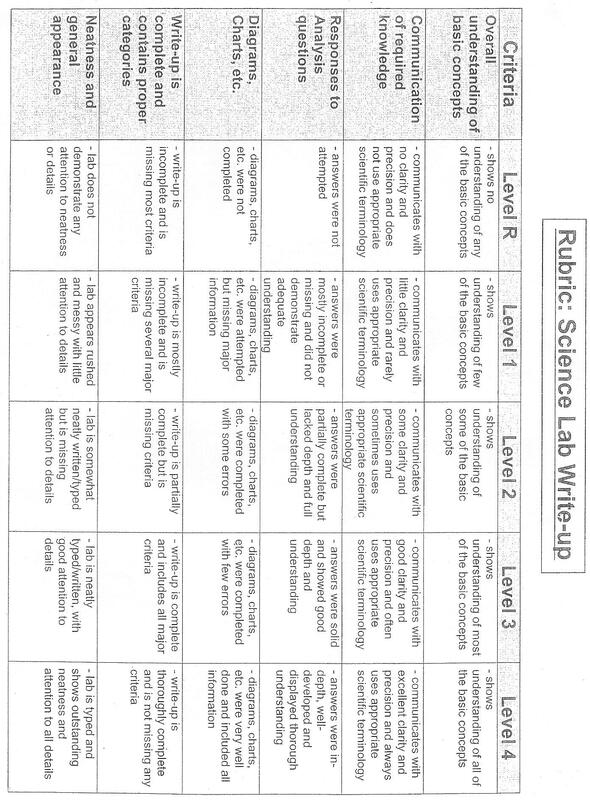 Today students were asked to complete a Chapter review from their SciencePower textbook pages 192-193 # 1-5, 13 and 15.